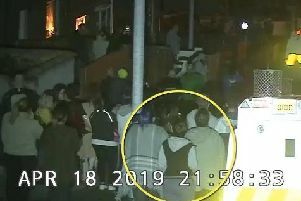 A 32-year-old man arrested in connection with dissident republican activity in Strabane has been released unconditionally. He was arrested under the Terrorism Act by detectives from the PSNI’s Terrorism Investigation Unit on Monday. The man was arrested on suspicion of two pipe bomb attacks in the town in 2017. He was taken to Musgrave Serious Crime Suite for questioning before later being released. Speaking at the time of the arrest, Detective Inspector Andrew Hamlin said: “As part of our ongoing investigation into dissident republican activity, a man was arrested earlier today in connection to two pipe bomb attacks in the Drumrallagh estate in Strabane in July 2017 and in Melmount Villas in August 2017. “The suspect has also been arrested in connection to a hoax pipe bomb which was left at the Footbridge in the town in March this year which caused serious disruption to the area.